This photo represents a group of women that have put their passions in motion. Each woman has a story, a purpose and a goal. They are contributing to society and impacting change. Read about all 130 Women of Impact, from 30 different countries, available on Amazon. impactmania's founder Paksy Plackis-Cheng captured more that 1 million words from 120 Women of Impact in 30 Countries. Join us, July 19th, from 5:30 – 7:30 pm (170th Anniversary of Seneca Falls) and learn more about women’s work, challenges, and avenues to impact. On Wednesday, April 18, 2018, the Peoples' Self-Help Housing's Jardin de las Rosas apartment complex and mural was unveiled. Masha Keating, along with local artists Phoebe Brunner and Cynthia James were present to witness firsthand the reactions to their collaborative, commissioned public art mural. The mural spans over fifty feet along the playground courtyard wall with fantastical landscapes, whimsical birds and animals, daydreaming children and bordered in large-scaled flowers symbolic of its namesake. The Jardin de las Rosas mural is located at 510 N. Salsipuedes Street, Santa Barbara, California. Please join Masha Keating for 1st Thursday at Studio C, SBCAST. 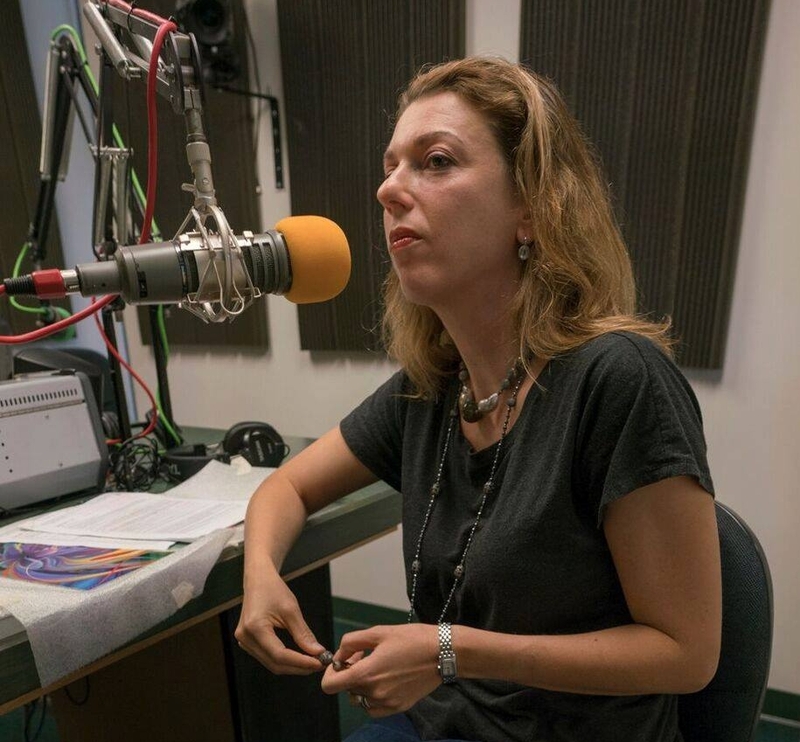 The Studio will be open December 7, from 5-8 p.m.
Photo courtesy of Elizabeth Stewart and KZSB AM 1290. The Santa Barbara Studio Artists are pleased to announce the 16th Annual Open Studios Tour, Labor Day Weekend, September 2-4, 2017. The purpose of this unique Tour is to promote the interests of professional artists working in Santa Barbara, as well as to increase public awareness of Santa Barbara as a valued destination for art and culture. Please join Masha Keating, along with many other local artists, for a day of touring and talking art. Buy your tickets below or on the day at Masha Keating's studio. Mark your calendars and save the date, Open Studios Tour 2017 is here! Over the past 15 years, Santa Barbara Studio Artists' have opened their professional studios up for hundreds of art enthusiasts and patrons to tour over Labor Day Weekend. 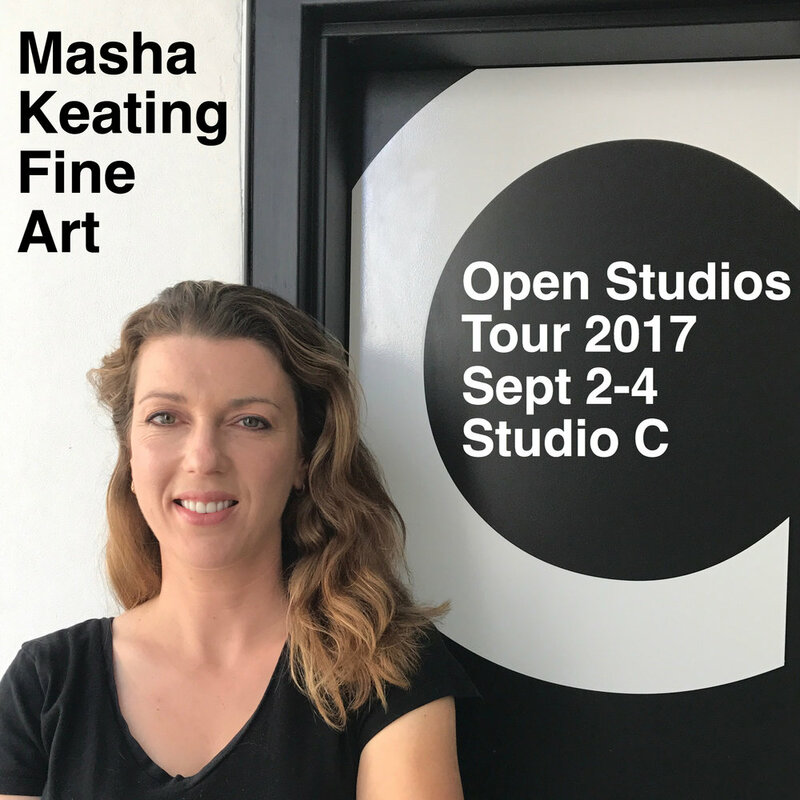 This year, Masha Keating is excited to be settled in her new studio for the Open Studios Tour. Buy your advanced tickets below. Extended for 1st Thursday! Distinctive Art Gallery has extended their group exhibition, Let There Be Color, until July 6th. Please join us at 1331 State Street, in Downtown, Santa Barbara, from 5-8 p.m. for an evening of diverse art from some of the best local artists around. Purple Orchid 2, digital painting by Masha Keating on exhibit at Distinctive Art Gallery beginning May 30, 2017. Let There Be Color, a group show at Distinctive Art Gallery in Downtown Santa Barbara, features some of the best local artists from the area. Among the featured, Masha Keating will exhibit three of her new large scale original digital paintings. In addition, Keating will also be featured in the front window with two of her smaller oils from the larger series, Begin Again. Please join us at the opening reception during Downtown Santa Barbara's 1st Thursday Artwalk, June 1st from 5-8 p.m. Exhibit runs May 30 — June 28, 2017. Gallery hours, Monday through Friday 10-5:30 p.m., Saturday 10-4:30 p.m.
Water Lily, digital painting by Masha Keating. Izen Miller Gallery is proud to be featuring Santa Barbara contemporary artist, Masha Keating, in their upcoming exhibit, Color Line Form. Keating will be debuting her vivid digital paintings in the El Paseo gallery. Opening reception May 20, 2017, 6-8 p.m.
New website, new studio, means new artwork is here. Masha Keating is officially working in Studio C at SB CAST, located in downtown Santa Barbara at 513 Garden Street. Studio C is open to the public every 1st Thursday of the month, from 5-8 p.m., or by appointment.